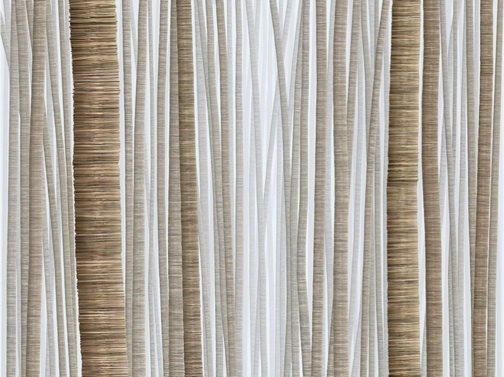 Paper Bags, 2007 60x80" Depicts 1.14 million brown paper supermarket bags, the number used in the US every hour. In Edward Tufte’s book, Envisioning Information, ideas are laid out about how to communicate information in “flatland” and escape the inherent two dimensional limitation of paper and computer screens. Tufte also warns against using “chartjunk” a term he himself coined to mean “data presentations that seek to attract and divert attention by means of display apparatus and ornament.” In other words, respect and do not manipulate the viewer. The exhibit of works by Seattle artist Chris Jordan, currently at the University of Colorado Natural History Museum’s BioLounge, will stun you with statistics presented in what seems art founded in the concepts that Tufte outlines in his book. “Running the Numbers: Portraits of Mass Consumption” (Jan 10 – April 30, 2011) is important because we seldom think about, much less grasp the environmental effect of our collective quotidian habits. How many brown paper bags does the US use in one hour? How much plastic cup waste is generated by airlines every six hours? How many aluminum cans does the US use every 30 seconds? These questions and more are answered in a way that, with any hope, will inspire self-reflection with another question: What can I do to stop the waste? Are Fossil Fuels in Your Future?